In a Medical Catastrophe: Excusable Professional Abandonment ? I would like to expand the previous thread regarding the ethics involved in professional responsibilities of physicians and whether they have choice or no choice in certain situations such as an infectious disease pandemic. Ken Kipnis, an ethicist at the University of Hawaii, recently wrote to a bioethics listserv the following, with extracts from his previous paper, dealing with the issue of professional abandonment in a medical catastrophe. He has kindly given me permission to reproduce his posting below. Also is included is his link to the full text of the paper. In a medical catastrophe, should physicians and other healthcare providers be punished if for personal reasons they are forced to abandon their patients? Is such abandonment excusable? ..Maurice. I addressed the issue of physician abandonment in a paper that, among other things, considered conditions that may have obtained at Memorial Medical Center in New Orleans following Katrina. What follows are two brief passages from that article. In the first, I distinguish between disasters and medical catastrophes. The ethical implications of the latter have not been well studied. In the second, I list considerations that could support "excusable" abandonment: It is not that abandonment is justifiable in a medical catastrophe (i.e., the right thing to do) but, rather, that clinicians in extremis who abandon patients should not be ethically or legally condemned for what they have done. It is assumed in what follows that it is not possible to evacuate the sick.
. The hospital (or any setting where medical care has been provided) has somehow become hazardous to the point where all must relocate to safety. Though this may or may not have occurred at Memorial Medical Center, there are scenarios where this condition would be met. Here are three. (1) An earthquake and ongoing aftershocks have caused structural damage and are threaten ing to topple occupied sections of a now burning hospital. (2) Biological, chemical or radiological agents have contaminated the buildings even while the clinical staff are unprepared to protect themselves. And (3) a deadly epidemic is fueling riots by angry mobs who believe that essential supplies are being hoarded inside. In all three cases, clinicians and patients are present in the hospital and, for different reasons, it is not safe for them to remain. #2[In the context of a medical catastrophe, the duty of non-abandonment] tests the commitments of physicians, nurses and others. While the obligations that clinicians have to their patients are weighty, it would be hard to defend the proposition that they are absolute: to be honored regardless of the costs to the caregivers and to others with competing claims. To be sure, the continuing presence of healthcare professionals may extend somewhat the lives of dying patients, may make the dying process more endurable, and may express a community's commitment to respect the dignity of those in the greatest need. But whatever the sources and the weight of the duty to remain with patients, it is an open question what burdens health care providers must shoulder in order to fulfill this professional obligation, and what expectations others (clinician 's families, other patients) must forfeit. A catastrophic collapse of a health care system can require doctors and nurses to work without proper equipment in uncontrolled environments; without adequate food, water, or sleep; and amidst hazards that threaten their own lives and health. What they can accomplish by remaining may be precious little and far less than what they might do elsewhere. At some point they may have done everything required of them. There appear to be two distinct justifications for setting a limit to the obligation to remain with patients where leaving them would constitute abandonment. In the first place are unreasonable personal burdens that healthcare professionals and their families would have to take on were they to remain. Family members and others may also suffer significant derivative loss. In the second place are competing professional obligations. As with the doctor in the Burma narrative, other patients may have weightier claims than the black-tagged patients. In a disaster, allocation rightly shifts resources to where they can do the most good. Accordingly, any decision to remain with victims who are beyond saving may violate weightier obligations to attend to salvageable patients i n urgent need of vital care. For these reasons, I will assume in what follows that the prohibition on abandoning patients cannot be absolute. One other consideration is worth mentioning. Consider the risks routinely taken by fire fighters, soldiers and police officers. Notice that the community helps them do their jobs in reasonable safety. Fire fighters receive breathing equipment and protective clothing. The burden of remaining at one's station despite hazards does not fall solely on their shoulders. Society must support essential services if it is to expect men and women to act heroically when the need arises. Now whatever the social obligation of firefighters to enter burning buildings, it is arguably diminished when a community fails to provide protective equipment and other forms of support. Likewise, if a community expects healthcare professionals to remain steadfast during a catastrophe, it must be prepared to s support them through the darkest hours, so they can keep at their work while protecting themselves. But when health care professionals are abandoned by the communities they serve, the duty to brave hazards may be attenuated. The paper -- "Forced Abandonment and Euthanasia" -- was originally published a year ago in the journal Social Research. Ethicists Ethicizing In Public About A Specific Case: Should They? I received the following e-mail today which I thought raised an important topic about ethics discussion. I have deleted those portions of the e-mail that might in any way identify the writer. We're working on a story about the death of an 11-year-old girl (reportedly of [named disease deleted]) after her parents chose prayer over medical treatment. I'm looking for people well-versed in bioethics who can talk about that decision. If you would be willing to share your expertise, I would be grateful. I can be reached at [phone number deleted], or on my cell phone at [phone number deleted]. I wrote back the following which I think covers my view of the subject satisfactorily but are there some aspects of my argument that you find wrong or incomplete? ..Maurice. [first name deleted], here is the problem I think that all "bioethicists" who speak in the public media should recognize before speaking as requested about a specific case: the full facts are unknown and perhaps unavailable and any comment about the ethics of a specific case is thereby faulty. The facts are essential basis for an ethical decision regarding some action. Each case is different from another and that is why our hospital ethics committee, in consultation, for example, may spend an hour or more with the stakeholders involved in the case-- to get all the facts including the viewpoints of each of them. Now, you may argue that what you are interested in is only my opinion regarding the general issue of the ethics of prayer vs medical treatment for a child. I might be able to do that but your writing of my opinion will still be in the context of the specific [state name deleted] case. And this is the concern amongst bioethicists about the broadcasting opinions to the public by their colleagues or in fact by anyone not closely involved in the case. The Terry Schiavo case would be a relatively recent example of public statements made by ethicists and other "important people" without full knowledge and understanding of all the facts. One other point, telephone conversations with the ethicist may lead to misinterpretations of the comments of either party and misspeaking. Written communication allows time to consider nuances in the questions and responses to be more objectively and effectively handled. Sorry..but good luck. ..Maurice. p.s.- By the way, the issue of bioethicists speaking to the public about a case might be a good topic for an article. If so, you may use my comments above. Should The “Yuk Factor” Hinder Finding The Good for Humanity? “Yuk!” is an expression used by some people applied to what they know or see as unnatural or disgusting. The “yuk factor” is how this expression can lead to the action of those people to reject and argue against what they understand is the unnatural. This issue was brought to my mind yesterday with a current news article : "LONDON (Reuters) - Research using hybrid human-animal embryos for experiments is ‘monstrous’ and should be banned, the leader of the Roman Catholic Church in Scotland said on Friday. Cardinal Keith O'Brien said a proposed new law -- the Human Fertilization and Embryology Bill -- should outlaw the practice." The issue appeared to me as to whether religion or morality should really separate nature into two categories, natural and unnatural and then apply the “yuk factor” to those which are deemed “unnatural”. "The Yuk factor boils down to a disgust at what seems unnatural. As we live with the unnatural, though, we begin first to accommodate it, then to accept it, then to appreciate it. ... The natural has no special moral status; it merely has a practical pedigree. That which is natural has the advantage of having been shown to work, and we should bear that in mind. But no gene ever knew what would work in advance, or applied itself to a greater purpose than its own replication; the choices recorded in the genome are not moral choices. Morality has only now come to the genome, because only now is the genome open to deliberate action by people with foresight and responsibility. We can choose life in ways nature could not. But we should not be bound by it." Hopefully, the expressions by the Cardinal regarding the use of hybrid embryos will not be acted upon since such outlawing of the practice may effectively hinder research leading to the healing or prevention of human disease. Let’s move away from simply saying “YUK!” to creating an uplifting, better, more constructive expression, “AHH!” (Advancing Humanity’s Health). What do you think? ..Maurice. Death with Dignity is the title of the state of Oregon's law which allows physician assisted suicide for its residents under strict rules. Each year, the Oregon Department of Human Services provides data regarding the utilization of that law. The following is the document that was made public for the 2007 experience. The figure below is the number of Death with Dignity Act prescription recipients and deaths by year in Orgeon 1998-2007. As you can see from the data,the Death with Dignity Act, while giving all terminally ill Oregon citizens an opportunity to make their own decisions about their deaths, the numbers of cases involved and the resultant numbers of deaths experienced from the presence of this law over the past 10 years has been trivial compared to numbers which had been predicted by some. ..Maurice. Oregon’s Death with Dignity Act (DWDA) allows terminally ill adult residents to obtain and use prescriptions from their physicians for self-administered, lethal doses of medications. The Oregon Department of Human Services is required by the Act to collect information on compliance and to issue an annual report. The key findings from 2007 are listed below. Formore detail, please view the tables on our web site: http://oregon.gov/DHS/ph/pas/index.shtml. 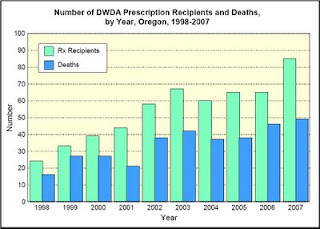 •During 2007,85 prescriptions for lethal medications were written under the provisionsof the DWDA compared to 65 during 2006 (Figure). Of these, 46 patients took themedications, 26 died of their underlying disease, and 13 were alive at the end of 2007. In addition, three patients with earlier prescriptions died from taking the medications, resulting in a total of 49 DWDA deaths during 2007. This corresponds toan estimated 15.6 DWDA deaths per 10,000 total deaths. •Forty-five physicians wrote the 85 prescriptions (range 1-10). •Since the DWDA was passed in 1997, 341 patients have died under the terms of thelaw. •As in prior years, most participants were between 55 and 84 years of age (80%)white (98%), well educated (69% had some college), and had terminal cancer (86%).Patients who died in 2007 were younger (median age 65 years) than in previousyears (median age 70 years). •During 2007, more patients resided in the Portland Metropolitan area (Clackamas,Multnomah, and Washington counties) (55%) compared to prior years (39%). •All patients had some form of health insurance: 65% had private insurance, and 35%had Medicare or Medicaid. •As in previous years, the most frequently mentioned end-of-life concerns were: loss of autonomy (100%), decreasing ability to participate in activities that made life enjoyable (86%), and loss of dignity (86%). During 2007, more participants were concerned about inadequate pain control (33%) than in previous years (26%). •Most patients died at home (90%) and were enrolled in hospice care (88%). •Complications were reported in three patients during 2007; they all regurgitated someof the medication. One person lived 3½ days. The Influenza Pandemic Has Arrived But There Are Not Enough Ventilator Machines! The news of the outbreak of flu at first came in little spurts from various communities across the United States. And there was bad news with each bulletin; patients were dying from the flu… a whole lot of the patients who were sick. The government labs then came out with the news that the sickness was due to a particularly virulent strain of influenza virus. We had all known that this might happen and now everyday came the news that the sickness had spread across the country to little towns and big cities and the influenza sickness was everywhere. The patients, many of whom were previously healthy, were developing pneumonia and becoming short of breath and would quickly die if they were not put on the ventilator to allow them to breathe. Even then, many died because of other organs that failed including the heart. More sickness and more deaths and there was no dramatic medication avilable to abruptly cure the illness. But it became obvious that some patients supported by the ventilator machine could be kept alive long enough for their own body defense mechanisms and other supportive treatments would allow them to survive the illness. Unfortunately, by now, so many patients were sick, couldn’t breathe and had to be put on a ventilator but there were far too many patients who needed the ventilator than the number of ventilators available. How and to whom should the ventilators be allocated? This is only one of the issues that will appear when a serious influenza pandemic strikes our country or other countries throughout the world. It is wise, therefore, to be proactive and plan ahead for the day when the deadly flu arrives. Planning, of course should be done by the appropriate governmental agencies but also there are reasons why these plans should be devised by input from the public. That is because, decision about how to set up the triage of patients involves issues which are less medical or clinical but are actually societal. If patients are found clinically to need the ventilator to survive, to whom should the ventilator be given? Only to the young? Would there be a cut off age? Only to the previously healthy and how healthy? Should leaders of elected government be given priority? Should those in prison be ignored? Should the poor be given first chance at a machine? Should sick healthcare workers and emergency first responders who are most needed to care for others and are at greater risk be given first chance at a ventilator? Who are the ones most needed? Are they the doctors? the nurses? the respiratory therapists who operate the ventilators or who else and in what order? If someone is on the ventilator, at what point should the patient be taken off and another patient allowed to use the machine? Patients who had chronic lung problems and were already on a ventilator at the time of the epidemic, should they be allowed to continue use or should they be taken off and the machine used for an acutely ill flu patient? All of these questions and more need the public input. As I already noted, the issue involving the limited number of ventilators available is only one concern in a pandemic. Others would include isolation of the infected, where patients should be treated if all hospital beds are taken and many issues of the management of education, business, economy, government including other issues of public safety. It is not too early to start a discussion by the public on these questions. For the present, on this blog, let’s discuss the ethical allocation of ventilator machines. ..Maurice. Palliative Terminal Sedation: Is it Ethical? Palliative care is treatment rendered to relieve the pain and suffering of an illness through the means of medications and other techniques both in situations where active treatment for the underlying illness is being carried out or in situations where there is no medical treatment to provide a cure and simply patient comfort care is the intent of the healthcare providers. Palliative terminal sedation is a technique of providing palliative care to terminally ill patients who despite attempts at other methods of palliative treatment fail to get relief from pain and suffering. The technique involves administering drugs that maintain unconsciousness when treatments to reduce pain and suffering in the conscious patient has failed, as they occasionally do. The intent of those who provide palliative terminal sedation is the relief of the suffering by rendering the patient unconscious and not to cause the death of the patient which death when it occurs is generally attributed to the patient’s underlying fatal illness. With palliative terminal sedation, however, it might be found that the arrival of death may be accelerated but this is not the intent of the providers. The question that has ethical implications is whether palliative terminal sedation is actually a form of euthanasia or physician-assisted suicide (PAS). Euthanasia is illegal in the United States. PAS is not accepted as professionally ethical by many and, of course, in the United States PAS is illegal except for its restricted and controlled application in the state of Oregon. The difference between euthanasia, PAS and palliative terminal sedation is clearly one of intent of the provider. In euthanasia, directly producing death at the request of the patient is the intent of the physician. With PAS, the intent is to provide the patient a means to end their own life (suicide). With palliative terminal sedation, the intent is to produce unconsciousness which finally relieves the patient of pain and suffering. Causing death or accelerating death is not the intent. Do all my visitors accept the notion that palliative terminal sedation is an ethical practice for the physician’s treatment of a terminally ill patient? ..Maurice. Christy A. Rentmeester writing in the Winter 2008 ASBH Exchange, a bioethics newsletter, discusses the tendency for students and young physicians to be exposed to and learn from their mentors callousness and legalism as the way to evaluate and treat patients. Callousness is apparent when a physician does not “..recognize features of his patient’s situations that configure what they need from him.” In addition, he does not "define what the patient needs and deserves from him broadly (instead of narrowly) and generously (instead of meagerly)." Think for example of a male patient who needs to consistently take a heart medication to prevent angina, a medicine to lower cholesterol and a blood pressure medicine to control the blood pressure. Suppose the physician simply writes the prescriptions and gives no attention to the financial and social status of the patient and whether the patient also has a wife who is also needs medication for her own high blood pressure and gout so that both, with limited income, will not be able to afford purchasing all the necessary medications. That behavior of the physician represents only consideration of the most narrowly defined needs (the written prescription) and no concern regarding how the patient is going to pay for the medications and whether the patient will not be compliant in taking the medications because of trying to support the medical needs of his wife and himself on that limited income. This behavior of ignoring the patient’s full needs represents a form of callousness. I would say that in both callousness and legalism, the there is the underlying behavior by the physician of only being minimally involved with the patient and making self-interest, not the patient’s interest, the major goal. Both Rentmeester and myself might be looked upon as being too harsh in our consideration of physician training. However, in view of the known “hidden curriculum” informally taught by those who train students and physician in their clinical years, there is a need be aware of distortions of clinical moral perception that can lead to callousness and legalism as the new doctors go beyond training. ..Maurice. Communicating Bad News: Does the Doctor Want to Tell, Does the Patient Want to Hear? The problem is there may be a resistance for the doctor to tell all the bad news and an interest to divert the patient’s attention from the longer term outcome, even if suspected as poor, to the more immediate shorter term potential benefit of treatment. The problem is also that the patient may also have a resistance to hear about the long term when there are tests and treatments readily available and seem to carry the potential for improvement of the patient’s current state. This can lead to“collusion” between the doctor and the patient where the true poor prognosis will tend to be hidden during the doctor-patient communication about the illness. Anne-Mei The, Tony Hak, Gerard Koëter and Gerrit van der Wal published December 2, 2000 in the British Medical Journal. 35 patients with small cell lung cancer were followed over a 4 year period. Although this study is from the Netherlands, I suspect that this observation should be considered in other countries including our United States. From the abstract of the article: “False optimism about recovery” usually developed during the (first) course of chemotherapy and was most prevalent when the cancer could no longer be seen in the x ray pictures. This optimism tended to vanish when the tumour recurred, but it could develop again, though to a lesser extent, during further courses of chemotherapy. Patients gradually found out the facts about their poor prognosis, partly because of physical deterioration and partly through contact with fellow patients who were in a more advanced stage of the illness and were dying. “False optimism about recovery” was the result an association between doctors' activism and patients' adherence to the treatment calendar and to the “recovery plot,” [yesterday the patient was healthy, today he is ill, but tomorrow he will be better again, thanks to the efforts of the doctor and the patient, with support of carers]. which allowed them not to acknowledge explicitly what they should and could know. The doctor did and did not want to pronounce a “death sentence” and the patient did and did not want to hear it. Relaying bad news to the patient and family is always a difficult exercise for the physician and some physicians are less skilled and have less experience in such communication. Although the estimation of when death will occur is always inexact, rough approximation can be made by published statistics. In addition, talking about failure is something difficult for many physicians who also worry that they do not take“hope” away from the patient. However, it is much easier for the physician to focus the discussion on tests and further treatment and tend to ignore the longer term prognosis all of which may correspond to what the patient wants to hear about from their physician. It may require in some doctor-patient relationships an “outside” professional, trusted by both parties, to tell the patient the realistic therapy and prognosis. ..Maurice. For those visitors in the Southern California area, here are two ethics lectures on the 25th and 26th of March which may be of interest. ..Maurice. The lectures are complementary attempts to articulate discontent with the ethical frameworks that the 21st century has received. Although I will not dwell on it, the conditions that defined the professions in the last century are breaking down, however strong their half-life remains. In particular, the claim to esoteric expertise has been undone by Internet accessibility of information, and peer control over professional accreditation and discipline is being challenged if not usurped by other regulatory means. What remains is trust as a necessary condition for professional work. Both lectures are about sustaining trust as an ethical practice. The first lecture deals with specific medical professionalism, and the second lecture discusses generalized dilemmas of professional work. The recovering caregiver is a healthcare professional who is ready to admit that his or her work is out of control, and that too many ideals of caring are being sacrificed. As extraordinary an achievement as the 1980s bioethics synthesis known as principlism remains, it offers little to the recovering caregiver. This lecture offers a 13-step program (thirteen because it’s one off from twelve, and an especially odd number) that focuses on practices, not principles, and integrates ethic into all aspects of healthcare. Dirt work is the recognition that even the best-intentioned action produces some kind of dirt. The ethics of professional work often neglects the inevitability of dirt; that neglect is especially evident when professionals claim to be artificial persons, acting on an authority outside of themselves. To imagine how professionals might do dirt work better, the lecture considers the figure of the trickster, who is the preeminent dirt worker of folklore and myth. Arthur Frank is the author of The Renewal of Generosity: Illness, Medicine, and How to Live (University of Chicago, 2004), The Wounded Storyteller Body, Illness, and Ethics (University of Chicago, 1995), and At the Will of the Body: Reflections on Illness (Houghton Mifflin, 1991). His work begins with a theoretically informed belief in the essential role narrative plays in all facets of medicine in order to provide us with a practical and ethical means of incorporating this knowledge into our various relationships and encounters with the health-care system. But then why after a week in the hospital, it is the hospital I hate? What is it about more than a few days of hospital existence that in many patients, a prolonged stay brings on patient anxiety and depression and a condition we all know as “hospitalitis”? Is it due to the routine of hospital life? ..the loss of privacy? ..the pain and discomfort? ..the paging and announcements on the speakers all day and all night? ..the lack of intellectual stimulation during the day and the lack of sleep at night? ..the missing of the usual normal life and the gnawing concern and fears about recovery and ever going home? There are some patients who find hospitals very comforting and hope to prolong their stay to the consternation of the hospital staff. However, it is my observation that most patients look forward to leave the hospital and leave their infection with hospitalitis behind them. Have any of my visitors had a case of hospitalitis and how did they explain the cause? ..Maurice. I would like to provide to my visitors more insight into what are ethical issues in medicine and what are not, what ethical dilemmas are and what are not. In a number of previous threads, I have written about activities and duties of hospital clinical ethics committees and described ethical dilemmas. In this thread I would like to further describe the work of the committee in parsing out what is and is not an ethical issue and what is and is not an ethical dilemma. A good part of the consultative work of clinical hospital ethics committees for example is sorting out those issues brought to them for advice between what is an ethical issue and what is not. Many times people jump to the conclusion that a clinical ethical problem is present in medical care and management when actually there is no ethical problem but simply (or not so simply) a problem in proper communication between parties. Often the basis for the problem in communication is one party providing inadequate information to another party, either from being rushed and skipping the telling of needed facts or that there are no such facts available. Also, when facts are available there may be inadequate explanation of the facts and the consequences of a medical decision. Sometimes the situation involves conflicts in the relationships, functions and duties of individuals or groups within the administration of a hospital with a subsequent potential impact on clinical care but not an issue about a specific clinical case conflict. This could, however, represent an institutional ethics problem. Another non-ethical problem could be related to standards of medical practice which usually is based on evidence-based decisions or medical consensus and have nothing directly to do with ethics involving the case under review. Finally, if the case represents an ethical issue and if there is a consensus in the ethical and legal experience with such issues that one principle should and will trump another then no ethical dilemma exists. I should explain that such consensus is based on agreement amongst bioethicists,lawyers, courts and, of course,general public opinion. For example, there is both legal and ethical consensus that any adult who has the mental capacity to make their own medical decisions has the ethical and legal right to withhold or withdraw any treatment for themselves, even treatments which are or would be life supporting. Yes, before the consensus was obtained a decision to withhold or withdraw would have been an ethical dilemma for example between autonomy and nonmalificence. That is between allowing the patient to make their own medical decisions but the physician by not doing something or by doing something that would cause harm to the patient. Autonomy now trumps nonmalificence in such a situation and there is no dilemma. Another resolved dilemma is that of the possibility of a terminally ill patient dying from an unintentional overdose of morphine in an attempt to keep the patient comfortable and free of pain and distress. Here beneficence trumps nonmalificence because of the principle of "double effect". The premature and unintended death of an otherwise dying patient who was given palliative treatment to relieve pain and discomfort is considered ethical and acceptable. Does Your Doctor Encourage You to Talk? The practice of medicine is not just lab tests and procedures which can be invasive. There is another activity of physicians which in a way is also invasive and that activity can be communication between the patient and the doctor. The doctor, if he or she is doing their best job, should be invading the patient’s memory and emotions. This process is necessary to gain the facts but also to gain an understanding of a patient’s feelings. The process should provide a means for the patient to express and ventilate how the patient looks at their illness and prognosis and what questions the patient might have that had not been already answered by the physician. To do this effectively, the process takes time, so the doctor has to provide the time. Also the doctor needs to not only show interest in listening to the patient but talk to the patient with a empathetic understanding. And more than that, the doctor must also detect emotional opportunities and when present to communicate in a way that encourages the patient to talk about their emotions rather than the doctor listening to a few words from the patient and terminating the conversation. As an example, physicians attending to advanced cancer patients needs to take advantage of emotional moments and promote their patients’ emotional ventilation. A recent study of oncologists and their recorded interviews with their patients found that oncologists encountered few empathic opportunities and responded with empathic statements infrequently. A patient’s physical illness is not always simply a problem with the body but the emotions may play a big role and it is the responsibility of the doctor to care for both. Does your doctor encourage you to talk? ..Maurice.